Washburn Engineering's state of the art RV repair facility was specifically designed to accommodate the repair of the largest RVs, Motor Homes, Winnebago's and Travel Trailers. All repairs are performed inside a climatically controlled environment. 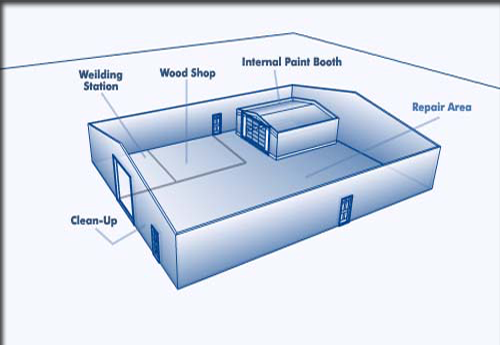 Our facility includes an RV clean-up station, a large Repair area, an internal triple filtered paint booth, a wood working shop and a weilding station. 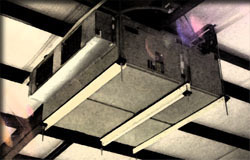 Proper tempeture is critical to insure that paint correctly adheres to surfaces and proper airflow is critical in the control of paint overspray.Wahsburn Engineering utalizes a custom built 15 ton heating and airflow control system specifically designed to insure a controlled environment.